Another year is rapidly coming to a close and marks 18 months here in Greece. It has gone by quickly and we praise the Lord for the blessing of being able to serve Him here. As anyone who had come over to help in the project here in Thessaloniki can attest, ministering here takes a determination and perseverance. We have seen growth in the people in the church, but it has been very difficult to make headway in the city itself. We have had countless great witnesses with individuals but there is such a grip by the Orthodox church – even on the somewhat non-religious – that it can be difficult for people to take the most important step to accept the Lord Jesus Christ as their Savior. We have our poles in the water with several individuals, so please continue to pray! Especially for Nikos, Nikos, Babbis, and Savas. In November, we had a special visitor Sunday. We had really built it up to have the people invite family and friends (something they were always hesitant to do before) and they were eagerly looking forward to it. I also passed out 1,000 invitations in the immediate neighborhood for this special Sunday. Unfortunately, not one visitor showed up! Fortunately, everyone in church had invited people. That was a HUGE step! They were disappointed that no one came but we had a great time of food and fellowship after and they are looking forward to trying it again. We will have another one in a month so please pray for that! Starting in February, we are going to begin having a special Sunday school time before the regular service for children and their parents. We are passing out invites for this and we understand we may not have any for a while, but we are really praying that God will take this opportunity to help us reach many more people in the neighborhood. Thank you all for your prayers and support! It is greatly appreciated! I just wanted to get you a few prayer requests for some things going on over here. Next Sunday is a planned bring a visitor day. We have talked it up for a few weeks and there was a good bit of excitement on the part of the people in church. They have been talking about who they are planning on bringing. We are planning a time of food and fellowship after and of course will be preaching the Gospel during the service. Even a couple of people who are not as faithful as others have said they will bring someone. Please pray that the Lord would move in the hearts of those invited and that nothing would keep them away next week (November 16). One thing I have learned about serving here is that people always say they will do something but then do not follow through. We want this opportunity for these closest friends and family members of the church people to hear the Gospel, most likely for the first time. But we also want the church people to be encouraged. Please pray they would follow through themselves in bringing their visitors. We will also be starting to pass out invites in the neighborhood shortly to invite people to bring their children for a special Sunday School time we will be having before the church service. To not be able to minister directly to the children is something that always bothers me here (not allowed to engage the children directly). There are so many around and we ask for prayer that the Lord would work on the parents to bring their children for this special time – and that they would eventually stay for the main service as well. This new service will begin after the new year (too many people traveling around the Christmas and New Year time). Finally, we had finished our series on Philippians a couple of weeks ago and I spoke about how the people of Philippi had given to Paul for the work when he was in Thessaloniki. I preached about how important it is to be involved in the work of furthering the Gospel of Christ around the globe and that Thessaloniki itself owes a debt for the giving of the Philippians to further Paul’s ministry here in Thessaloniki. We used that to start a missions offering that we will be taking through the end of the year for Bro. Holt. It was such a blessing to see even those without any type of money or income come and drop some change in after the service – and continue to do so. When we speak of and pray for the work in Sierra Leone, they are realizing that there are many places with more difficulties than Greece faces and it is a blessing to see them get involved in spreading the Gospel. Thank you for taking the time to pray for these requests. We are excited to see the growth in the church and interest in getting the Gospel out. Please pray as we continue to do that here that people would get saved and grow as well. The church services have been going well. We have had some people visit for the second and third times, which is a blessing. We have also had some faithful people at every service, which is a big blessing on Wednesday night when it could very well just be our family and the translator! I have started doing the Parables of Jesus on Wednesday and Elia is really following along and learning more already. It is amazing sometimes to see how the Lord directs parts of the service as I will get some questions after that are about a comment I just made as an aside but people were really thinking about it. One such case was with Harula, the elderly lady who comes. I had mentioned something about images and she came right up after to ask if it was a sin to make and have images like they have in the Orthodox church. It opened up a very good discussion with her and she was very sincere in her curiousity about it. These people have been in and around the Orthodox mentality all of their lives and to hear about things such as images, or icons, being wrong is something of a shock. Last week, we had a problem with an apartment above the church building. Apparently, the occupant of the apartment had left their faucet on when they left for vacation. That meant it was dripping heavily through our ceiling. I met the landlord there and we went around to hunt down which one it was. It turned out to be a blessing because we had curious neighbors come in to expect it and I got to give them Gospel tracts and invite them to come back for service. They have not come yet, but you could see them looking around and taking the building in – and not in a bad way. They may have never thought about coming before but now that they have at least come across the threshold, they may consider coming back. Please pray for our neighbors! One of the men in the church, Leonidas, had been gone for several months last year with a heart problem. We had been unable to contact him and were very nervous about him. When he came back, he told us about the ordeal and he still looked like he was on the road to recovery. Well, he has been faithfully coming again lately and has even come for church even when things were going on in his family that would have kept him from coming before! He is looking a lot better and very happy, so thank you for your prayers for him! Finally, one more note about the church. Please pray for Kayode as he has been in London for a few weeks and will be returning soon. 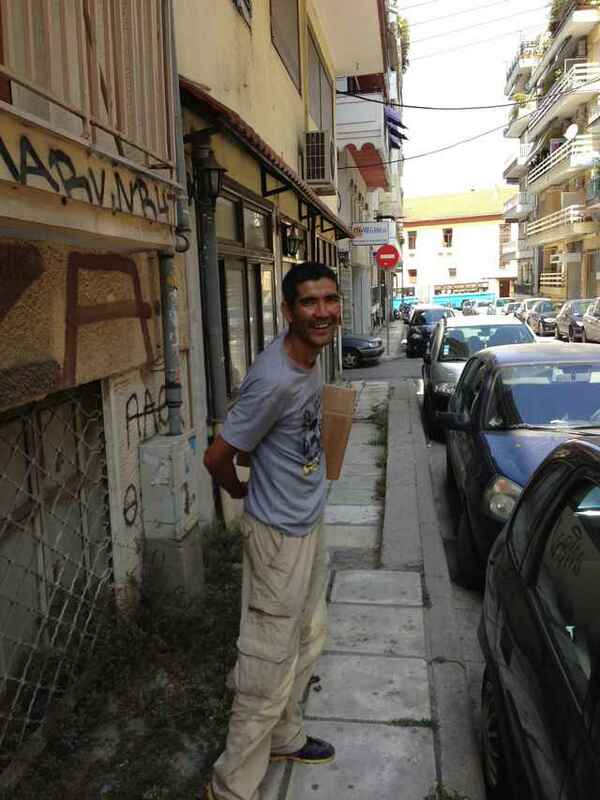 Please pray also for Tasos as he is returning next week for a while. Though the job had not worked out for him as well as he had hoped in Germany, we are very happy to have him back (and he is happy as well). He will be studying for another job for several months so please keep that in prayer. Before we left for the US, we had started to get the ball rolling with our residence permits. When we first came here, we had plans to be gone and on to Israel at the end of the year. So, we had not put too much into the paperwork necessary to stay longer. Well, God has had different plans as our paperwork necessities for Israel are not yet done so we will get to continue to stay here and work with these people for a while! But, that meant working on paperwork. To make a very long story shorter, after 12 visits to the immigration office, visits to government offices, multiple visits to a lawyers office, the changing in demands for paperwork 5 times, and over $1,000 in fees, we have residence permits good for two years! Well, I have mine and the family has temporary ones as we wait for one final paper to come from the US. I know some of you knew about that and prayed and we are grateful! With school and college out, a lot of the crowd that I am normally able to converse with are not around. Fortunately, I have still be able to meet several people to witness to. 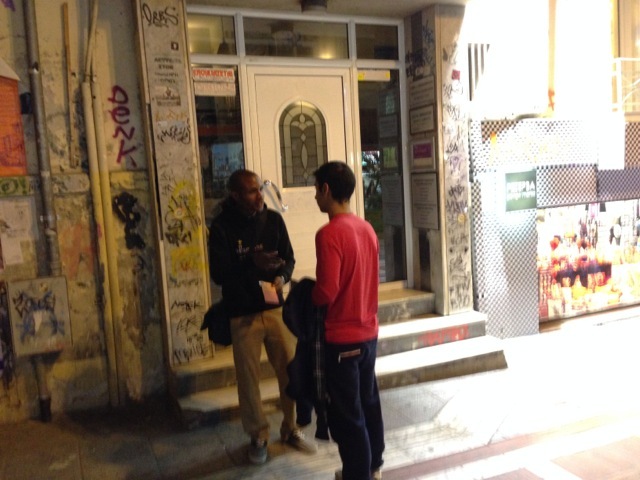 Please pray for a young man, Kosmos, who is an agnostic but listened very closely as I got to give him the Gospel for almost an hour. I had challenged him to come to church and he has said he might do that and he knows right where it is (always a positive!). 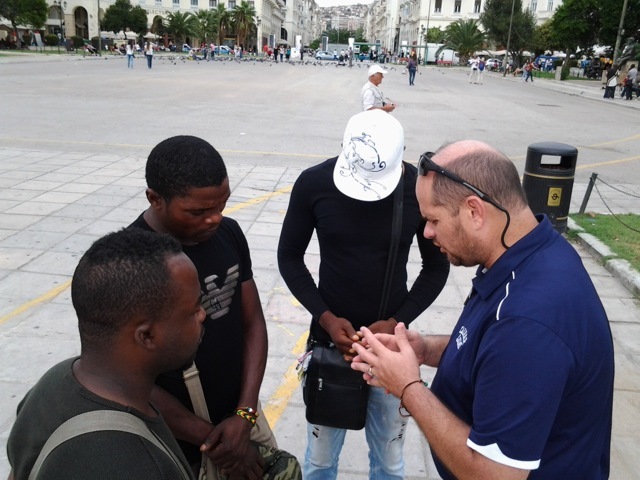 Please also pray for Aries and Dimitris as two other men that I got to give a good Gospel witness to. And, finally, we have been able to communicate more with our immediate neighbors. I cannot write their names because I know I would mess them up (hard to understand them sometimes!) so please just pray for this family as they have small children near our kids’ ages and have been very friendly with us. 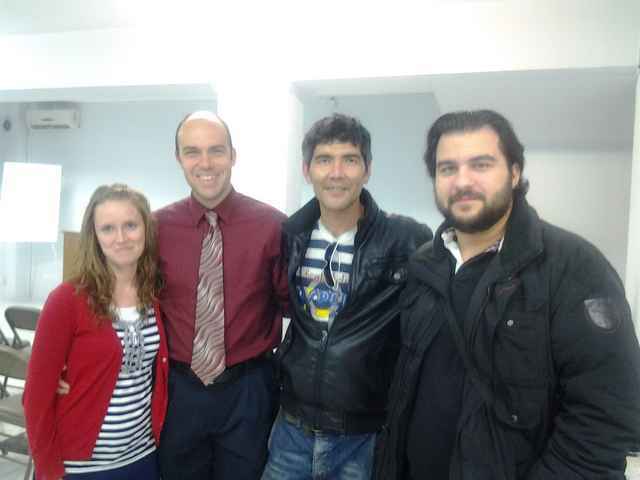 The language barrier is not too bad, but pray that the Lord would help the Gospel to be fully understood and conveyed. Thank you all once again for your prayers and your support of this work! It would really not be in the form it is today with your help and we thank God for your faithfulness. Please continue to pray for our little church as we experience some of the growing pains that all churches go through in their early existence. It is difficult for some people as it is like learning about something that they had never heard before. With that simplicity of spiritual things, there can be misunderstanding, so please pray that the church would continue to grow, spiritually as well as physically. Over the last few weeks, there have been several new visitors. Some of these visitors have come several times. I will be meeting with a few of them in the next week to become more familiar with them and them with us. One of the ladies that visited is currently going to a Pentecostal church but seemed convicted during the sermon and wants to come back. She has asked for prayer for a couple of things from the church. There is one thing that I would like to ask people to pray for as well – she is married to a Muslim and is praying that he will get saved. 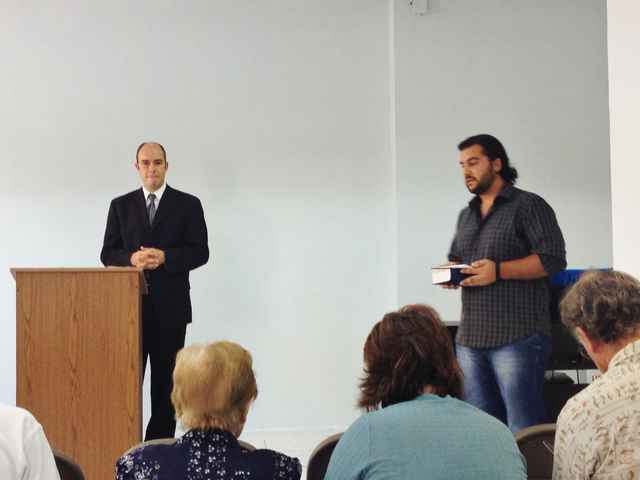 One of the most faithful members of the church, Tasos, had to leave to go to Germany for work. It was a really sad parting. Fortunately, he needs to come back in a couple of months until the end of the year and we will be continuing our Bible studies online. He also has a nice church to go to while in Germany. Please pray for his family who is back here. His son has come to church many times and we will be getting back together with him when he returns from vacation. There are several people that the Lord has been working with here. I do not want to list their names here but the Lord knows and I ask that you continue to pray for them and the work here. We have been working/calling about our residency paperwork for a while now. It is amazing how confusing it can be! One of the sticking points on the list of requirements was that we needed physicals from a government hospital here. The problem is that we can actually never get to the point where we even make an appointment. We have been having friends calling and talking to doctors to see how we go about it and they keep saying that we need to know what kind of physical because there are many different ones that they require. At the same time, they say that since we are already here, we do not need to have a physical. I went to the immigration office again today (for about the sixth time) with a friend to help me out. After a few hours, we finally have more information and have an “informal” appointment for next Thursday. Please pray about that as we all need to go down there and it will be a few hour process. Also, almost all of our Greek/English speaking friends are out of town, so please pray the one remaining will be able to help us. We will let you know how it goes! Please pray about the finances for the church. We are running low on the money for the church and could use more money to help keep the church. Thank you for your prayers and giving! The last month has been a good one here in Thessaloniki. We are getting out in more areas of the city for ministry and the warmer weather is bringing many more people out during the day and night. It is great to be here in the service of the Lord! 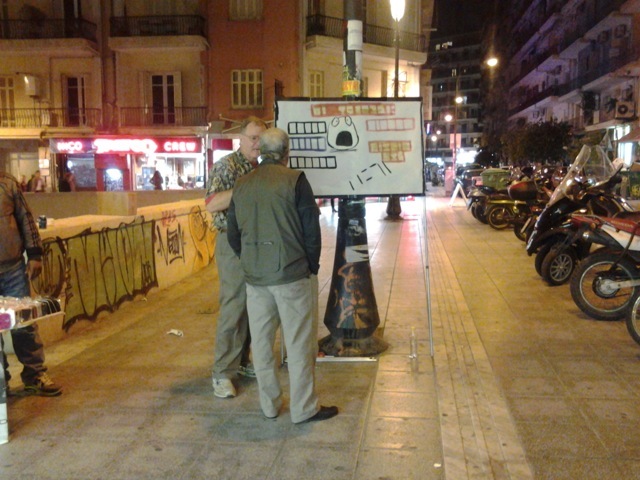 The nighttime ministries in the area of the old palace and near the arch have been going very well. Everytime we are down there, we get to witness to college students. Kayode has been able to meet and witness to a young JW a couple of times that we met down there. He understands the JW doctrine is not perfect, but does not want to give in quite yet. Please pray for him. We have also had some college students come up and ask where the church is because they are interested in attending. We have yet to see them come out but we are still praying for them. Please pray for them with us. I started attending Greek classes on the other side of the city and have already had great conversations with two of the ladies about the Lord. One of them says that she will come to church. In this case, I will be with these people twice each week, so I get to keep on them about it. 🙂 There are 12 people in the class and I am making my way through the class to speak with them about the Lord. Please pray for these souls here. The other day was my first class there and we finished off the class by carrying on some Greek conversations with each other. One of the women asked me what my job was and I looked to the teacher to ask her how I would say “pastor” – I had already told her what we were doing here – and she was a little puzzled about what it might be so just told the woman that I was like a Babas (or little father, which is what they call their priests). The women got all excited and just kept saying, “Bravo, Bravo!” 🙂 At least it gives me something to work with! Within the church, things have been improving Spiritually. One of the men has been having great witnesses with his family. One of the family members wants to speak with me about salvation next time we are together. Another man in the church told me how much he wants to leave the things in the world that he has been involved in for so long because he sees how there is no hope or joy in them. He wants to start getting together weekly for studies (which before he had kept pushing off). It has been a blessing to have several one-on-one Bible studies with some of the guys here as it has been a joy to get to know them more and see them grow. Please pray for these men. One of the men who had been coming quite regularly, Leonidas, just disappeared around September of last year. We had tried calling him but the number said his phone was disconnected. People that knew him did not know where he was either. We have been praying quite a bit for him that he would be safe and God would bring him back one day. He finally came this past Sunday. He had had major heart surgery last year and been in the hospital for two months. Since he got out, he has been having a very slow recovery. This was the first time he had been able to come to church again and he was happy to be there. Please pray that his recovery would continue to go well. It was such a relief to see him again and know that he is (finally) doing well! Our family is doing great. Our daughter, Chloe, got saved this past Monday night! It was such a blessing and is such a joy to have our two oldest children saved and on their way to heaven. Our oldest son, Charlie (he got saved in December), had been telling me that he had been witnessing to Chloe and telling her that she needed to get saved. I told him that night, “See, that is such a good thing you did to tell her that she needed to get saved – now she did it!” He was really happy and told me, “Dad, now she can tell someone else how to get saved and they can tell someone else and it can keep going like that. That way, soon everyone in the world will know how to get saved and want to so that everyone can go to Heaven!” Such a sweet heart from our little 4 year old! We pray his interest in souls never leaves him! Thank you all once again for your giving and prayers for the ministry here. We are thrilled to have a small part in it and be your extension on the ground here. May God bless you for all the physical work you did here and the spiritual work you do laboring in prayer. With the colder weather here (nothing like the US, so we are not complaining! ), some people have not been at church in a while. However, it has started to pick back up again with a wonderful group of people at church today. The one-on-one Bible studies are going very well and seeing some growth. We also have seen some bring family members that we are praying for –please pray for these souls with us. We had a sad time when Telemachus lost his nephew in a car accident. The nephew had translated for Bro. Brent last year so some at the church knew him (and a couple knew him well). I went to the funeral service with Telemachus and was able to meet many of his family members. Please pray for Telemachus and his family. He is doing well but could use the prayer for God to continue to help him. I had the opportunity this weekend to spend some time with some of the guys outside of church. It was a blessing to be with them some more and get to know them a little better. We also had a church fellowship dinner a couple of weeks ago. It was a blessing to have many of them participate in making things for it. People are finally starting to be out on the street more lately! College students are slowly coming back and we are once again having a good time witnessing to them in various places around the city. I have gotten to know some people downtown better lately and being able to give them the Gospel. My Greek is slowly getting better for understanding (and speaking a bit more) so I am able to communicate a little better with some people. It is a blessing being out with Kayode as his Greek is very good! 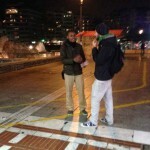 We are still doing night time evangelism in certain areas of the city each week and seeing great reception by the college crowd. The hardest thing for me has been not being able to speak Greek well enough to take advantage of opportunities with “Greek” time. I was in an office the other day for a couple of hours and had people all around me in line – and none of them spoke English. Our family is doing well. We had some family visiting last month and we enjoyed having them see the ministry here. Our kids are learning Greek words and the people at church love hearing Daniel (our little two-year old) speak some basic Greek. Thank you once again for your prayers! It is comforting to know that so many are praying for the work and for us. Please continue to do so. I have taken a couple of trips into the Middle East over the last couple of months and will be doing another one this month and next. Please pray for fruit on those trips and safety for my family while I am gone. The church has seen some people come and visit and others leave. With the winter and holiday time, people move around more than normal so we are hoping and praying that they will come back soon. Please pray for Kosmas and Leonidas. 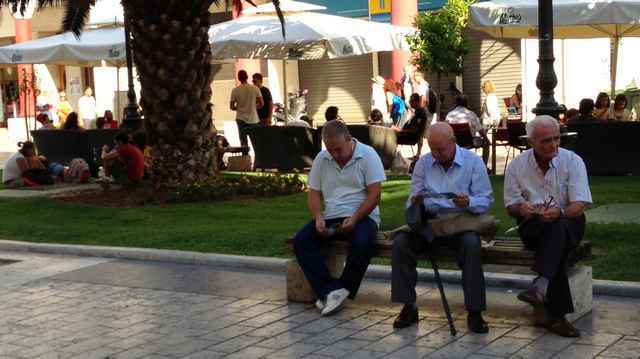 They have been gone for a couple of months now and their phones are not working. We miss them (Kosmas had been coming faithfully almost every service for a couple of months). Telemachus has begun to come faithfully again. 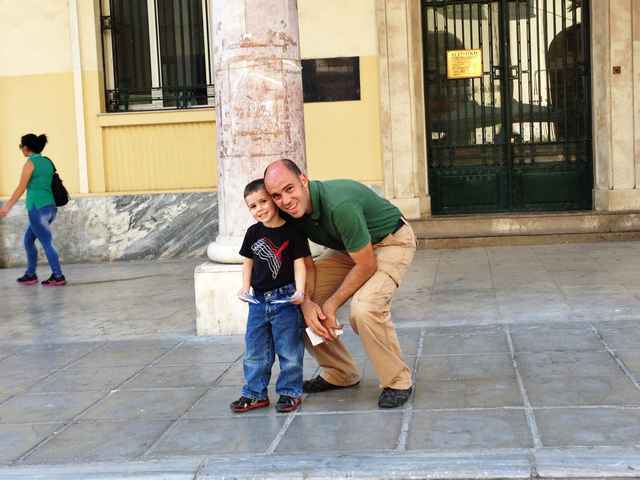 Please pray for his son, Alexis, who continues to have health issues. These health issues were the reason that Telemachus had been gone for a while. We do praise the Lord for a son of one of the men – he has been coming quite regularly with his father (the son is a young teenager). Please pray for him that the Lord would do a work with him. I couldn’t believe how slow things got around here once the middle of December hit! We go out in the evening often to pass out tracts and we thought that the evening time would be perfect in the shopping district near Christmas time. No! The stores were actually closed by 8PM on a Saturday night! We did have some crowds that we came upon but not like I would have thought. Once it was a few days before Christmas, the city turned into more of a empty place than a regular city. The colleges had let out and the students left town (students make up the largest groups we talk to, especially at night). Some of the days I was downtown, there would be maybe a dozen people that would come around over the course of 20-30 minutes! This was like this for most of the time from Christmas to New Years – there were 8 days between Christmas and January 6th that stores were closed (which meant far fewer people out)! On January 6th, they celebrated the 12th day of Christmas with a ceremony not far from the square. They would throw crosses into the harbor to bless the water and then have young men jump into the cold water to retrieve them. There were thousands of people out there that day. It was a very religious crowd of whom many scoffed at me as they passed. Praise the Lord that many still took tracts. 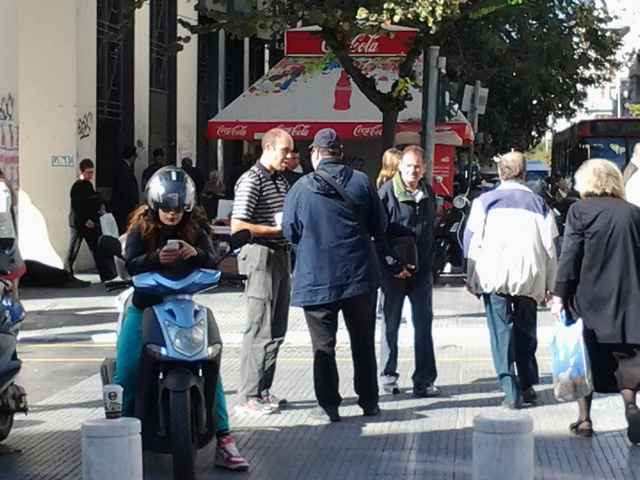 Now that the weather is warmer, the streets are again crowded so the evangelism has been going well. Kayode had to go back to London for a couple of weeks and he was sorely missed. It is good to be out with him again. We are still working on our Greek and it is coming along well. We are feeling more comfortable in speaking with people and I am even able to have some basic conversations on the street. Please pray that continues. Thank you all for your continued interest and prayer. We greatly appreciate it and need it! 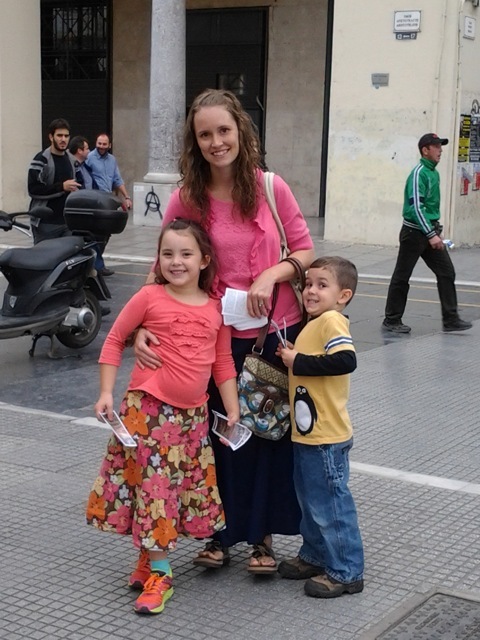 We praise the Lord that we have the opportunity to serve our Lord here in Thessaloniki. God bless! First, let me thank all of you who have given to help the project here continue. Our support does not cover the church expenses here so we were in great prayer for the financial needs as the money was to run out in November. The Lord came through with a week to spare as God’s people gave to help it. It was a blessing to share the blessings with the church people here. Please know that they (and us!) are extremely grateful for you following the Lord’s leading! The church here is really doing well. For a time now, we have about 18-19 in attendance on Sunday morning. Since the last report, we have seen a couple of new people that have begun to attend regularly and have been a blessing. One of them is a college student from another country that has a great desire for the things of God and witnesses to people regularly. I have been able to get together with many of the people during the week (outside of service) to have studies and find out where they are at spiritually. It is encouraging to be one-on-one with people and learn more about them as we look to be a blessing and pray for them with knowledge. The evangelism has been carrying on as normal. The schedule is that typically Elia, Kayode, and myself will go out letter boxing a couple of days a week (normally) while Kayode and I will go out in the city center (sometimes with Tasos – another man who has been coming for a couple of months) and pass out tracts and search for people to witness to. On other days, I go out by myself and walk the route from church to the square as there are many college students (and some of them speak English) along the way. 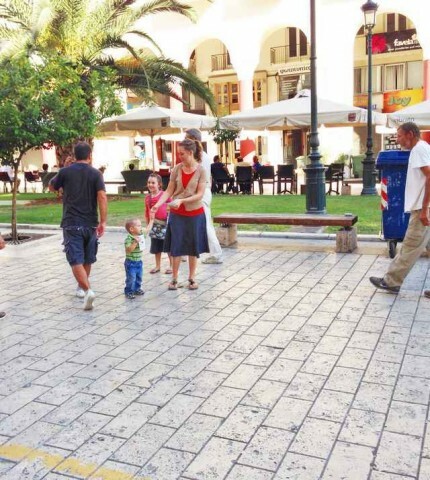 Then, on one or two nights a week, Kayode, Dan (another man at church), and myself will go out at night in Aristotle or near the old palace (down the street from the arch) and we will evangelize some more. Bro. Dan does sketch board preaching and Kayode and I have begun to play our instruments (guitar and trumpet) to gather the people before the preaching starts. After that, we will pass out tracts and Gospels of John to those who walk by the sketch board. Lately, we have seen many great witnesses come through this – some nights, all three of us will be engaged with people at once. The square near the palace is filled with college students and drug addicts at night. We see a lot of college students that stand to listen or come up to us. Please continue to pray for all of these outreach efforts that souls will be saved and the Gospel will continue to go out with free course. When we were here last year, we noticed that they convert the square into a huge festival area of sorts for Christmas. We are planning to really take advantage of that this month as we saw the area filled with hundreds of families last year. We are not allowed to give tracts to children (of which there are many of at this time) but our children can! We plan on going down at nights as a family to reach as many people as possible while they are the most open of any time of the year. Also, one of the main streets that intersects near the square is the large shopping street. 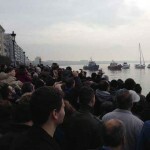 It is PACKED with people and has proven to be a very receptive place to pass out tracts at night. Please pray that we will be able to reach many people during this time! Since our last letter, we were blessed to have my in-laws (Evangelist Jim Walker and his wife Linda) come for a couple of weeks. I was gone for half of it to another country for evangelism so it was a blessing to have my father in-law and mother in-law here with my wife and kids. My father in-law was able to help replace and upgrade some things at the church as we look to make some improvements on it. Last week, we were very blessed to have Bro. and Sister (Bernard) Courtney here for the week (they are from Bro. Knox’s church). They had volunteered to come to teach us as much Greek in a week as we could hold. It was an intense week! My wife and I picked up a lot from Bro. Bernard (Friday alone was 10 hours of Greek) and now we are going back through to match the hundreds of Greek words in our heads with the English translations 🙂 We will be continuing this to be able to better minister with the people around us. Thank you, Courtney family! 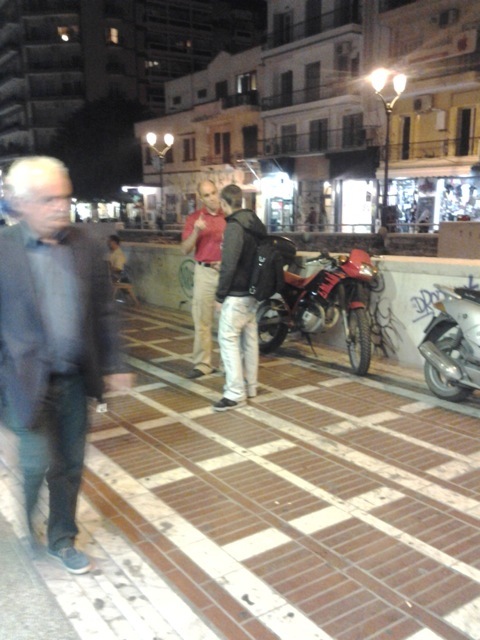 Talking to a man in the square. We continue to have new visitors to church. We have several that have come and a few that have kept coming back. We have been trying to do some things with the church building itself and many people have stepped forward to help out and participate, and doing so gladly. It is a blessing to see the church working together! One of the new members does design work and has translated and laid out Bro. Logan’s doctrinal book into Greek. We are getting them printed up and planning to start some new studies for those who were not here for that last year. He is also helping us by doing some other design work to help us get the Gospel out even more. Some of the people in the church have been wanting to participate in the evangelism and that has been a blessing. We are planning some larger outreach opportunities as the year comes to a close here and some of the people have already expressed excitement in helping out with it. One of the great things that I enjoy seeing at any church is the length of time that people like to linger for fellowship after church. I believe it is a good sign to see people enjoying each others’ company in the Lord and it is very evident here. Most Sundays will see the last people leaving about an hour after service ends! Please continue to pray for the people that come to church faithfully. It is surprising how many of them have difficulties with family members in relation to their desire to go to church. One of the men actually sneaks to the church and no one knows because of what their reaction to his coming here would be. One of the ladies is only allowed to read her Bible when she is not at home because her husband will not allow it. We are praying to see whole families saved and worshiping God together – please pray with us that this would be realized. The other night, we were getting ready for church when a man came to the door and asked what “Baptists” were. He asked if this was some new movement because he had never heard of it before :). I began talking to him and found out that he was a Muslim from Iraq. I was able to witness to him for about half an hour. 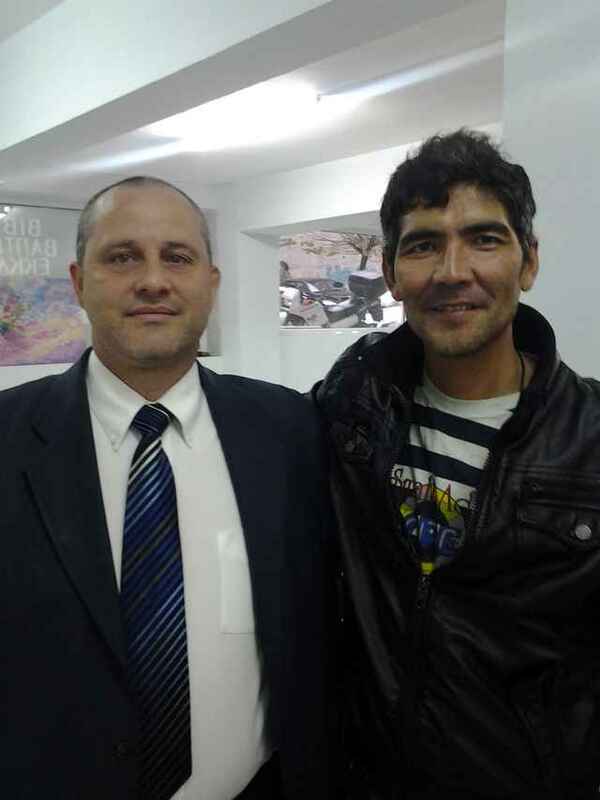 Please pray for Hamid that he would come back again and accept Jesus Christ as Savior. Towards the end of our conversation, Elia came to church and was able to communicate with him a little more deeply in his own language. It was a blessing for Elia and a good testimony for Hamid. The evangelism has been going very well. 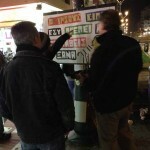 We have begun to go out at night each week in addition to the day-time evangelism. 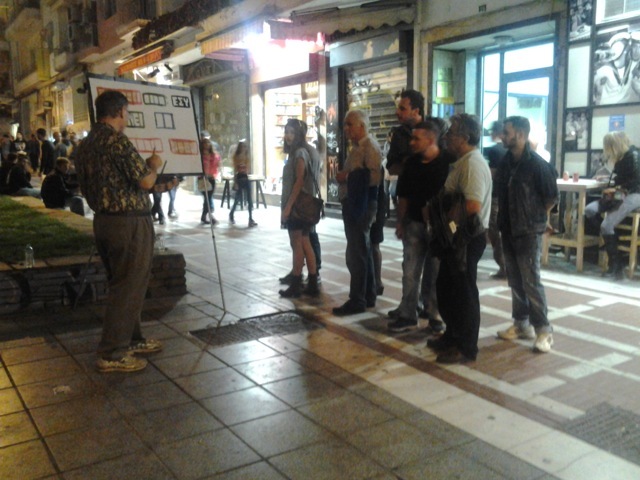 One of the brothers here has been doing sketch board preaching. We found a great spot near the ruins of the old palace that sees hundreds of college students going by as well as a large gathering of drug users/drunks. We went out a couple of nights last week and saw many people stop to hear the preaching and many personal witnessing exchanges happen. As one of the brothers mentioned, the young people are really so important here since they really have no affiliation with the orthodox church and are willing to listen. We are really praying to see more young people saved and in church. Our family has been going out together every so often as well. The kids are really enjoying going out – our littlest, Daniel (almost 2), calls it doing “yassas” (his little Greek for hello). 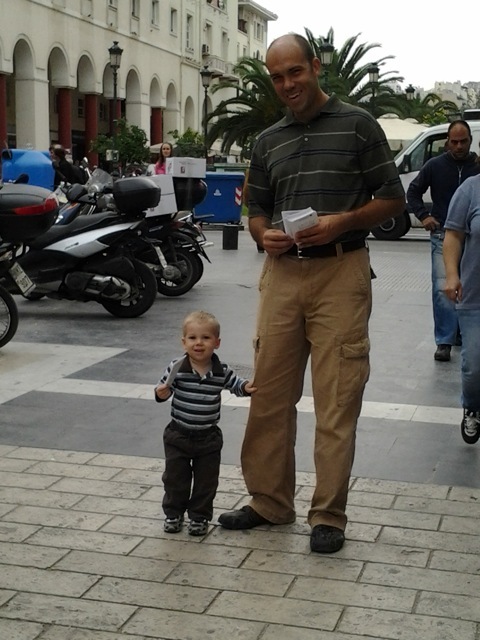 He loves running up to people and saying that while handing a tract. It always neat to see people ignore us but take it from the kids. We had a brother from the states, Bro. Pledger, that visited with us for a couple of days. One of the days, he and Kayode were talking to some of the guys selling bracelets. After giving the Gospel to them for a while, they bowed their heads in prayer to receive Christ – a blessing! In addition to the public ministry, we have continued in the gospel distribution from house to house. We have been covering some very large areas lately. For the most part, the reception with those we are able to talk to when we are out in the neighborhoods has been good. I did have one middle-aged man that was angrily throwing a pile of them in the dumpster. I went over to get them out and he started yelling at me. I just took them back from him and the dumpster and went on my way. He started walking right behind me and grabbing them each time I went to put them at a house. I just started trying to see if I could out walk him before I resumed again – it took about 1/3 mile to do that. 🙂 When he disappeared, I went up a bit more and worked my way back. It is always so discouraging to find someone like that who takes it upon themselves to prevent others from hearing the Gospel. There are many such Elymas (Acts 13) here. The good part about people like this is that we had one lady that came to church on Wednesday as a result of finding the packet in thrown in the road. She came to church as a result! The Lord is able to continue working even when others mean it for evil. We have some plans to branch out with some other avenues of outreach in the coming months. Please pray that God would bless it and that much fruit would come as a result. This past month has been a blessing here as we have seen more people going out to witness and many great witnessing opportunities with many people. The church has added some new faces and we have continued to meet with new visitors and have Bible studies with those as well. The family is doing great and we are very thankful to be involved in the work here. Thank you for your continued prayers and your support that helps keep this work going that so many of you have had a personal hand in. Thanks for posting this for us! Young man who only spoke French getting the Gospel over the phone from Bro. Dan’s wife in French! Things are going very well at church. We have had a couple of new visitors – one came from an hour away to visit (but cannot come consistently). She is not saved and knows it. She will be moving out of the country soon but as promised to return before so she can talk with us more. We had another visitor a couple of weeks ago who has been a complete blessing. This brother got saved in Germany a few years ago and has not been in church for many months as he was trying to find one that would work for him. 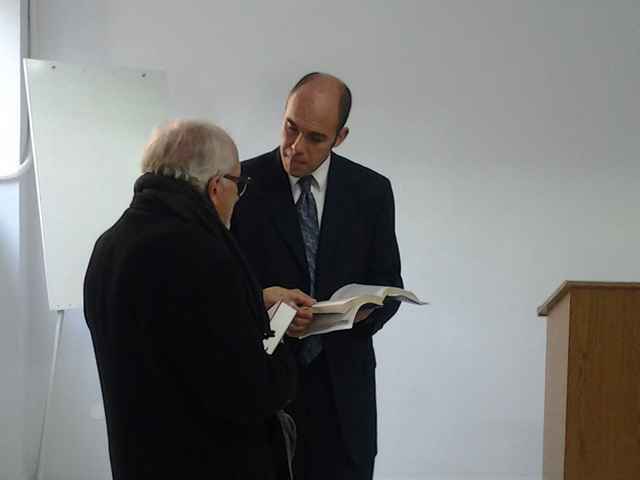 He listened to a lot of preaching online and finally figured that he was looking for a Baptist church. He ended up finding the only Baptist church in town and has been faithful ever since! We have been meeting once a week for Bible study and he is helping me with some Greek as well. He is very eager to help in church with anything and will be helping me with the layout and printing of some church invitations that we will start using door-to-door soon. Last week, our regular translator was out of town and all of the options we had were not working out. 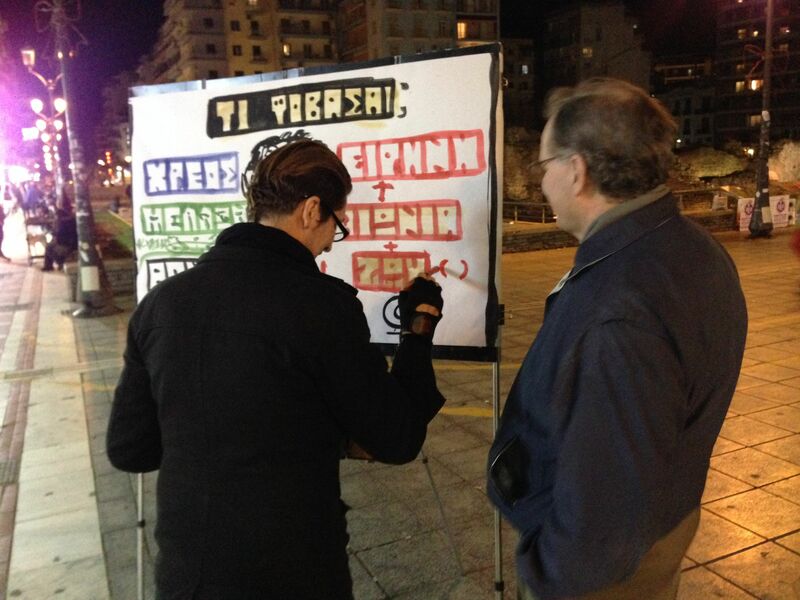 Tasos (our new brother) was willing to try to translate and he did an excellent job! Praise the Lord for such willing church people! The Wednesday evening Bible studies are going well also. The prayer meetings have been a blessing. A typical Wednesday evening starts at 7 with prayer, goes into the service and then we have about an hour or so of discussion afterwards. It is a real blessing to fellowship with everyone around the Word of God. Elia has been faithful about going door-to-door with me lately. Every service, he eagerly asks when we are going to do it next. Kayode returned here after being in London for a while and went out with us as well. I had a portion of the map that we were going to work on and we ended up doing double the area while we were out. We went through several thousand that day. We are starting to get feedback from people in the neighborhood around church as we continue. Many people are starting to ask friends/acquaintances about the church and I have had a chance to talk with some of them as well. My wife was witnessing to a woman in the city who was asking about the church only to have her daughter chime in by saying she knew where it was. It is a blessing! As for street work, it is getting better as the people stop leaving town so much during the hot days. The days are beginning to get cooler which is bringing more people into the city. On one of my days home from the city, I stopped at the store to pick something up. (to preface, I had been praying lately for one of the police officers that had responded to the accident last month because he left before I was able to get him a Gospel tract. I really felt bad about that and had been praying that he might hear somehow). As I pulled into a parking spot, I recognized that the guy who pulled up next to me was the police officer I had been praying for (he was in plain clothes)! 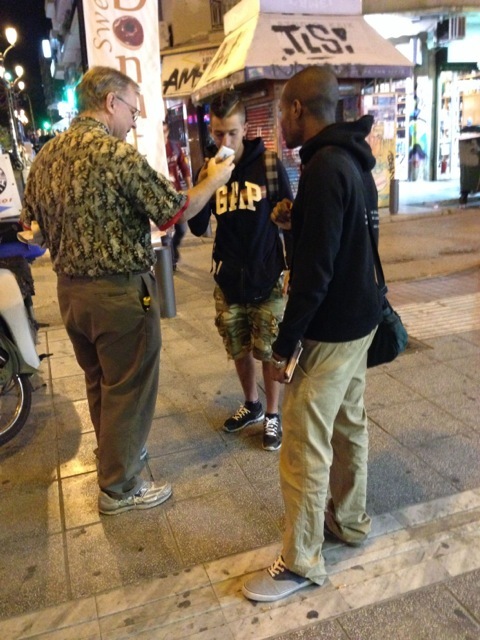 He remembered me as well from that day and I was able to give him a tract and tell him the Gospel. He listened and even said he would try to come to church some day! Please pray for this officer. Thanks again for all of your prayers. We believe God is working here and we are very happy and thankful to be a part of it. We ask that you continue to pray for the work here that it would grow, spiritually and physically.